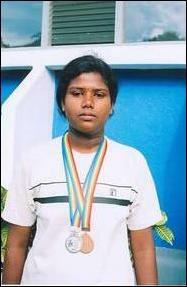 The women’s wing of the Liberation Tigers has commended Miss.Tharani Seevaratnam, a student at the Akkarayankulam Maha Vidiyalayam in Kilinochchi, who was placed second in Discus Throw and third in Shot Putt in the under-15 category, in an island-wide competition held at the Sugathadasa stadium in Colombo in September, sources said. Miss. 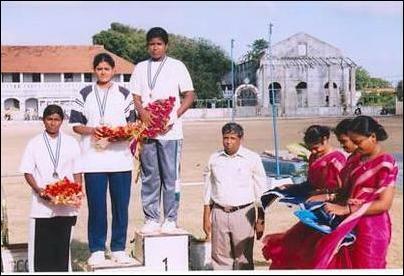 Seevaratnam won the first place in Shot Putt at the Tamil Eelam National Sports Competition held in Jaffna earlier this year. 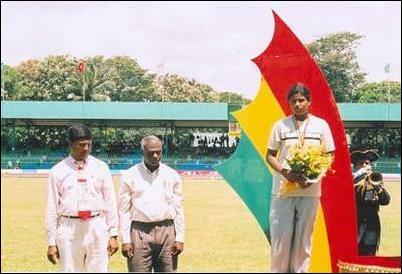 She broke previous records in Discus Throw, won several championship shields, gold, silver and bronze medals and numerous certificates, and brought honor to her homeland. Miss. Seevaratnam has excelled in studies too. She won a scholarship at the island-wide scholarship competition for Grade 5 students earlier and has continued to do well in her studies. Her parents, Mr. and Mrs. Seevaratnam, are keen to ensure that she is well-rounded, and her teachers are encouraging her to pursue excellence.